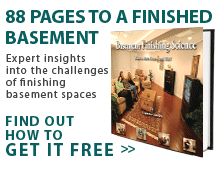 Certified Total Basement Finishing Dealer serving Rhode Island and Southeastern Massachusetts, including Cape Cod. The materials and products we use are not only strong and durable, but also eco-friendly! Our basement windows, for example, are properly insulated to eliminate drafts and wasted energy. And while our SaniDry Air System can remove over 90 pints of water from you basement each day, it uses just 6.8 amps of energy daily. I am very satisfied with the work completed at my property. Prompt service, area cleaned up and installation done with care and attention to detail! We chose DryZone over a local contractor because they specialize in basements and felt the product they use is far superior. I was very satisfied with the job and the installation team was incredibly nice. The salesman did an excellent job with the presentation, and the office staff was very good to me. I am very pleased with the level of work and service I received. Our quality basement systems produce a lot of talk around town, but it's our experience, professionalism, and service that contribute to our large number of Rhode Island basement finishing referrals. Our reputation precedes us, which is why we have extended our RI service area to include Providence, Warwick, Cranston, Pawtucket, and Woonsocket. To receive a no-cost basement remodeling inspection and estimate, contact one of our Rhode Island basement contractors today! "It was just a filter change and check up. A good year, no problems this..."
Would like to finish our basement. Currently just storage. Interested in finishing at least part of our basement. We would like about 3/4 of our basement finished, hopefully to include a family room and half bath, possibly also a bedroom, depending on cost. Need to finish a 20x18 basement and staircase by mid-July 2018. Would like to make an appointment for a free quote to refinish basement and possibly garage. Hi, I have an outdated finished basement. I'd like a quote for demolition of the existing work and installation of a moisture-proof basement environment. Getting quotes on finished about 3/4 of the basement. Finishing for a kids playroom. Looking to have a drop ceiling installation. Getting quotes now. Hi, we have a large unfinished basement with existing full bathroom, natural light and walk-out. Interested in renovating this to include a children's play area, TV area, wet bar, and cedar closets. Also interested in adding a sump pump, but not sure if it is necessary. Looking into finishing my basement. Looking to have basement redone. Basement remodel with bathroom/bedroom/family room/egress window. Comment: Would like to finish our basement. Currently just storage. Comment: Interested in finishing at least part of our basement. Comment: We would like about 3/4 of our basement finished, hopefully to include a family room and half bath, possibly also a bedroom, depending on cost. Comment: Need to finish a 20x18 basement and staircase by mid-July 2018. Comment: Would like to make an appointment for a free quote to refinish basement and possibly garage. Comment: Hi, I have an outdated finished basement. I'd like a quote for demolition of the existing work and installation of a moisture-proof basement environment. Comment: Getting quotes on finished about 3/4 of the basement. Finishing for a kids playroom. Comment: Looking to have a drop ceiling installation. Getting quotes now. Comment: Hi, we have a large unfinished basement with existing full bathroom, natural light and walk-out. Interested in renovating this to include a children's play area, TV area, wet bar, and cedar closets. Also interested in adding a sump pump, but not sure if it is necessary.